The Arts of Fashion Foundation is a 501(c) (3), public, non-profit organization, linking both academics and professionals alike and is dedicated in fostering international cultural exchange through the creation of a variety of educational programs meant to facilitate critical thinking and advance the field of fashion among artists, designers, scholars and students. The primary focus of the foundation is the continuous support of creativity and design process in fashion and the arts linked to it. 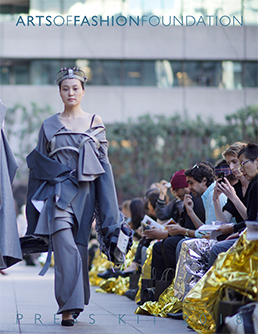 The Arts of Fashion Foundation is the First American organization to bring together emerging fashion designers from around the world to share and celebrate creativity in Fashion. The Arts of Fashion Foundation was created in December 2001 as the U.S. extension of the world renowned Concours International des Jeunes Créateurs de Mode, an international student design competition sponsored by Air France and the Fédération Française de la Couture, du Prêt-à-Porter des Couturiers et des Créateurs de Mode. Introduced in 1982 in Japan, this global competition lost its main sponsor in 2006, and thus was closing the book on an illustrious period of 23 years supporting and launching thousands of young talented fashion designers in Paris. With the inception of the U.S. segment of the foundation, Nathalie Doucet, a fashion design professor and designer, chosen as the director (2001), introduced seminars, lectures, debates, and hands-on workshops to the competition, making the annual Arts of Fashion Symposium an extraordinarily rich fashion event. Each year, an honorary president is chosen by the Foundation, and new lecturers, from the different facets of fashion design are brought in to share their experiences with the attendees. However the Arts of Fashion Foundation had entered into a new era in 2007, with the competition growing from a national one, to becoming instead an international showcase of talent and a week long fashion symposium with seminars, fashion shows, and awards ceremony. Since then and every year, prizes are offered, including four-week scholarships in partnership with prestigious institutions such as Ecole Superieure des Arts Appliques Duperre in Paris (2008), Ecole Nationale Superieure des Arts Visuels La Cambre in Brussels (2009), and Les Arts Decoratifs - Le Louvre since 2010, as well as apprenticeships in creative fashion design Houses such as Anne-Valerie Hash, Jean-Charles de Castelbajac, Veronique Branquinho, Manish Arora, Maison Lesage and Maison Lemarie, part of les Metiers d'art Chanel. From the very beginning, (2002), the Tandem-Series - launched with Didier Grumbach, President of the Fédération Française de la Couture, du Prêt-à-Porter des Couturiers et des Créateurs de Mode at the University of Cincinnati - provides an open dialogue amongst the guest speakers, professionals, faculty members and students, and is constantly addressing the challenges and opportunities of the fashion industry. Soon after, the CarteBlanche-Series (2004) was introduced at Oklahoma State University, giving room to exhibit the works of students, and designers from around the world. This series allows designers to present their designs on runway, or set up mounted exhibitions in host galleries and museums. In 2005, the Symposium MasterClass-Series were first initiated to great success in San Francisco, offering to candidates selected to the competition and local students the option of working intensively during 5 days under the direction of world-renowned designers. The Fashion-Edu-Series - launched in 2008 at North Texas University - and is aimed at the educational community, incorporating and addressing current issues facing the academia, and the fashion and design education programs globally. The Arts of Fashion Foundation celebrated 10 years of promoting creativity, innovative design and cutting edge fashion of emerging designers and students from around the world on October 29-30, 2011 at the inspiring San Francisco Art Institute. Steven Kolb, CEO of the Council of Fashion Designer of America, joined the group of jurors and participated in the Tandem-Series. Since then, the annual Fashion symposium is successfully held in San Francisco at the end of October. The year 2018 - with the theme Transgression - marked the 13th anniversary of the International Arts of Fashion Competition in the United States., bringing a new stunning collaboration with the Asian Art Museum of San Francisco on December 17. Director of Collaborative Educational Initiative & Research of the Arts of Fashion Foundation. Manager of Marketing & Communication of the Arts of Fashion Foundation. Treasurer of the Arts of Fashion Foundation. Director of the Debut & ShowRoom - Series of the Arts of Fashion Foundation. Director of the CineToile - Series of the Arts of Fashion Foundation. More than ever before, the fashion industry at the global scale is ruled by mass corporations who turn fashion into mere product for mass consumption. Motives are dictated by short-term profitability, thus undervaluing creativity, innovation, and craftsmanship. One of the challenges for the American fashion industry as well as for the design education resides in the adoption of a copyright law for fashion design. Even if the passing of such a law can only help to end the productions of copycats and to diminish the piracy industry, young professionals will access to the creative positions that they deserve and to be recognized for their work. This copyright law will also stimulate and secure creative minds to develop their own designs and to be creative and independent. The United States could ride the crest of a new revolutionary fashion, fueled by the creative potential of their young designers. - Corporations will not only be pushed to rethink and regulate their current standards of copyright in order to avoid any litigation action or negative publicity but this law will encourage them to invest and work with true designers rather than looking for trends and shopping for ideas. - Students will have to learn how to develop their own creative potential. Schools and Universities will have to review curriculum and adjust their way of teaching fashion design. Diversity, equity and inclusion are at the heart and essential leitmotive contribution to the success of the organisation with opening of multiple programs, completely independent and neutral, regardless of nationality, gender, race, sexual or religious orientation for their participants. - The annual symposium works with more over 120 international schools and universities from at the least 30 countries and in a one-year long based competition; 50 semi-finalists participate in a fashion show whereby 8 awarded students receive professional apprenticeships and scholarships. This symposium also offers two lecture series: Fashion.edu examines the future of design education, and Tandem-Series spotlights innovative business practices. - Programs also incorporate cross-disciplinary boundaries reflecting to the meaning of all the “Arts of Fashion” and its numerous fields. Exclusive collaborations have been established with the excellence of the Haute Couture craftsmanship in Paris, allowing students to work on their own project in collaboration with iconic crafts such as the embroiderers Maison Lesage, Maison Lemarié and pleaters from Lognon, all part of Les Métiers d’Art - Chanel. Such experimental educative programs - combinaison of a heavy mix of know how, craft and techniques - with transmission of a true reservoir for creativity that fashion carries, and since its very beginnings - will not have been possible without the dedication of inspirational creative profiles: “designer for designer”. Genuine personalities make a huge impression on students and play a very important role in their fashion career development, transfusing them some complex ideas and contemporary concepts while sharing their own design process as well as their precious network. This impact is paramount on the way students, educators, and entrepreneurs are rethinking the future fashion industry while they go on to serve as positive agents of change.